Eastern Wyoming College announces the first round of the NJCAA Region IX tournament. The Lady Lancers will host Lamar Community College Saturday, March 4, 2017 at 6:00 pm in the Petsch Center gymnasium. Admission is free, please come and support your Lady Lancers. Please come and support your Lancers. Eastern Wyoming College in Torrington and Douglas will be opening at 10:00 am on Friday, February 24, 2017. The EWC Fitness Center in Torrington will open at 10:00 am as well. Updates will be posted on the EWC website and EWC social media sites. Eastern Wyoming College will close today, Thursday, February 23, 2017, due to the weather. Updates will be posted on the College’s website at ewc.wy.edu or on the college’s social media pages. The Eastern Wyoming College website has full details of the search for a new president including the presidential profile and timeline. Progress reports will be posted as new information is available. 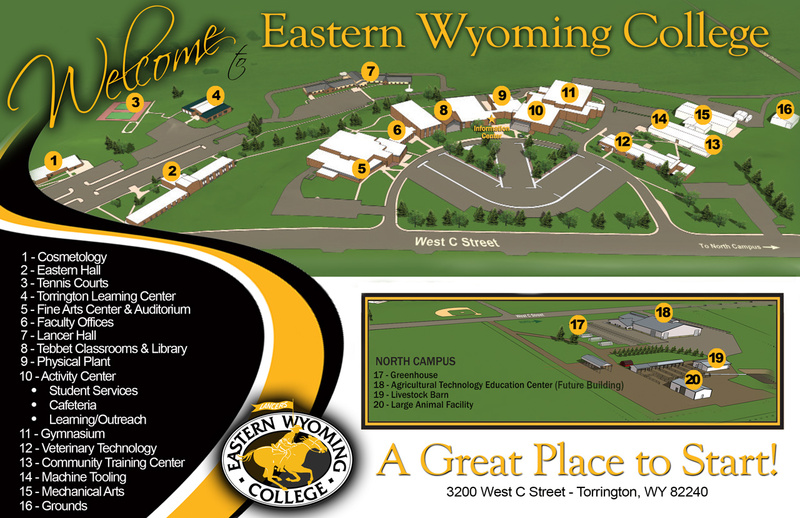 The site can be reached directly at ewc.wy.edu/presidentialsearch or through the link on the home page at ewc.wy.edu. The EWC Board of Trustees also have finalized the presidential profile which is listed below. For questions concerning the EWC Presidential Search please contact search liaison Holly Branham at 307.532.8303. Eastern Wyoming College has received official notification from the Accreditation Commission for Education in Nursing (ACEN) that the application for Candidacy has been granted for the associate degree in nursing program offered at the Douglas Campus. Candidacy status is based on the nursing program demonstrating it is currently compliant with selected ACEN Standards and Criteria and demonstrating the potential to achieve ACEN accreditation based upon the selected ACEN Standards and Criteria as reviewed in the Candidacy presentation. EWC will now continue through the process which will include an accreditation site visit and additional reporting requirements. There currently are fourteen students enrolled in the first cohort class offered by the college. For more information on the EWC Nursing Program contact Delger at 307.624.7020. The Community Education office at Eastern Wyoming College in Torrington announces date changes and time change for the following youth classes. Due to conflicts with the instructor’s schedule wee ball basketball for ages 4 to 6 will be held on March 18, 25 and April 8 and 22nd. The class times will be the same. 4-5 year olds at 10-11:00 am, and 6 year olds at 9-10:00 am. The spring Cookie Frenzy class time on April 8 has been changed to 1:00-4:00 pm. Eastern Wyoming College hosted the Wyoming Academic Challenge on February 18, 2017. Seven Wyoming high schools sent eleven teams to compete. The two to four-member teams participated in four rigorous rounds of competition. Questions ranged from current events, and mathematics to literature. Schools participating were: Campbell County, Cheyenne East, Douglas, Lovell, Pine Bluffs, Riverside, and Sheridan. Cheyenne East High School team #2 placed first with a total of 790 points, those students are Zane Dobler, Danielle DiJohn, and Alex Pachniak. Second place went to Cheyenne East team #1 with 660 points, those students are Tyler Miller, Jimi Hayes, and Ren Nisley. Third place went to Sheridan High School with 640 points, those students are Ethyn Etchechoury, Marissa Brenneman, and Ammon Duncan. Riverside High School won the small schools division with 410 points, those students are James DesRosier, Adelle Stone, Bret Thomas, and Calvin Williamson. The winning teams were presented with plaques and medals. Students on the overall first place team were presented with scholarships to attend EWC. For more information, please contact Casey Debus, at 307.532.8375. 1st place: Cheyenne East High School team #2 students win the Wyoming Academic Challenge held at EWC. All Star Tournament Qualifiers that were present on Saturday. There are 15 qualifiers throughout the state. Eastern Wyoming College is now accepting registrations for an American Heart Association CPR/First Aid/AED class. This class will be held on Saturday, March 4, 2017, 8:30 am in the Community Training Center on the Torrington Campus. The cost of this class is $50. The Community Education office at Eastern Wyoming College in Torrington is offering a Party Planning and Creative Events class. This class will be held on Saturday, March 4, 2017 from 9:00 am to 12:00 pm and the cost is $25. Great parties take great planning. Instructor Erika Stupak has a long history of planning awesome parties. From a “mustache party” to a “superhero party” to a sit down dinner party for 25 people! Erika will share creative tips on how to develop an idea (from what you know), working with any budget (big or small), looking for a venue, where to look for theme-based party decorations that fit your budget, selecting who to involve in planning and set-up, and how to bring it all together to make that special day an extraordinary event to be remembered by all. Erika will share pictures of some of her memorable parties just to encourage you to think outside the box when planning your next event. Although not necessary, participants are encouraged to bring an iPad or laptop to this class.